On a warm September evening, at the Agricultural Society Hall where he has been a long time trustee, Trip Barnes was awarded the 2018 Creative Living Award. Trip’s front porch and office were recreated at the Hall and friends stopped by to share their stories with and about Trip. The Creative Living Award was established to recognize members of the Vineyard community who embody Ruth Bogan’s independent and lively spirit. Like Ruth, Trip can “fix anything, cope with any emergency, and meets every problem as a challenge to be confronted with courage and intelligence.” With his ‘can do’ attitude and his deep appreciation and love for the Island, it is abundantly clear that Trip is a winner. Amongst the visitors who joined him on the porch, were two past Creative Living Award winners, Allen Whiting and Ross Gannon. 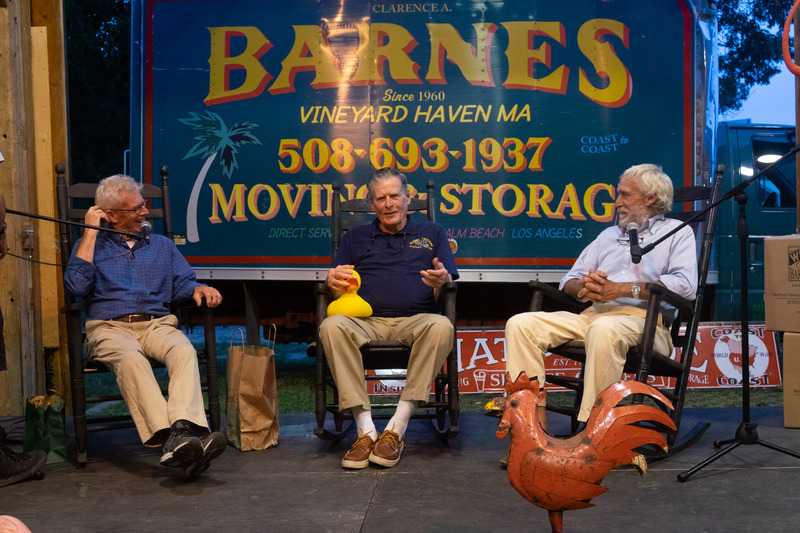 We are most grateful to our two local newspapers for attending and reporting on this event ~ Please read their stories in the Vineyard Gazette and in the Martha’s Vineyard Times.